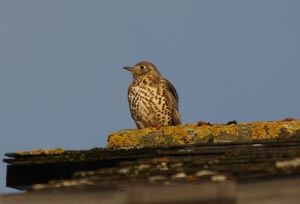 I’ve have had some marvellous bird sightings this month whilst out in the countryside. The first was seeing a barn owl in flight whilst travelling near Pulford. The owl with its distinctive white feathers and rounded face flew up from a field from a probable kill, before stalling in flight as I approached, and then headed off into a nearby oak tree. Later that week in Northamptonshire, I saw another remarkable sight of over 1000 golden plover repeatedly taking to the air above a lake, as a sparrowhawk tried to attack them. There is safety in numbers and by flying closely together this tight knit group, twisting & turning in flight, were protecting each other by distracting the aerial attacker by their patterns and movement. Golden plover a close relative of the lapwing were once common visitors to the Chester area but are now extremely rare. 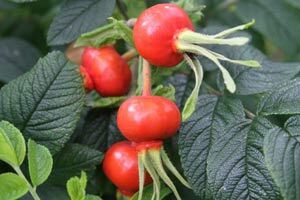 Smaller birds having fed to their hearts content on the food rich hedgerows during the autumn, have been feeding well in our garden recently, and our seed feeders have been emptied much faster than usual. I find sunflower hearts, crushed peanuts and high energy bird food are the best for us, and I also place the feeders close to a hedge to prevent direct attacks from the nearby sparrowhawk. 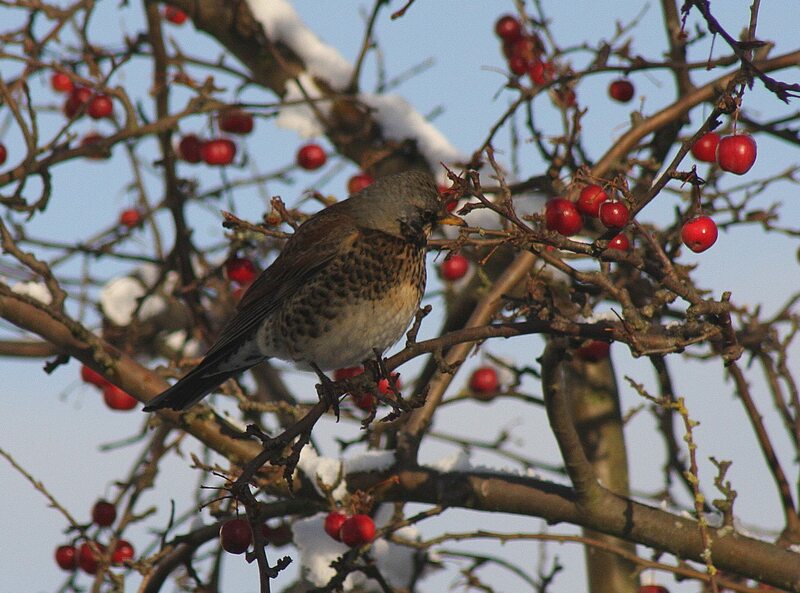 The small birds can hide in the hedgerow and then take a quick flight to the feeders before an attack can take place. Niger seeds are also useful to attract goldfinches, but like other species they too will now feed on almost anything. The other important element of any bird friendly garden is to provide water in a small container, or even better, a bird bath. All birds love bathing even in the coldest of weathers as it keeps their feathers clean, and they also seem to enjoy it. 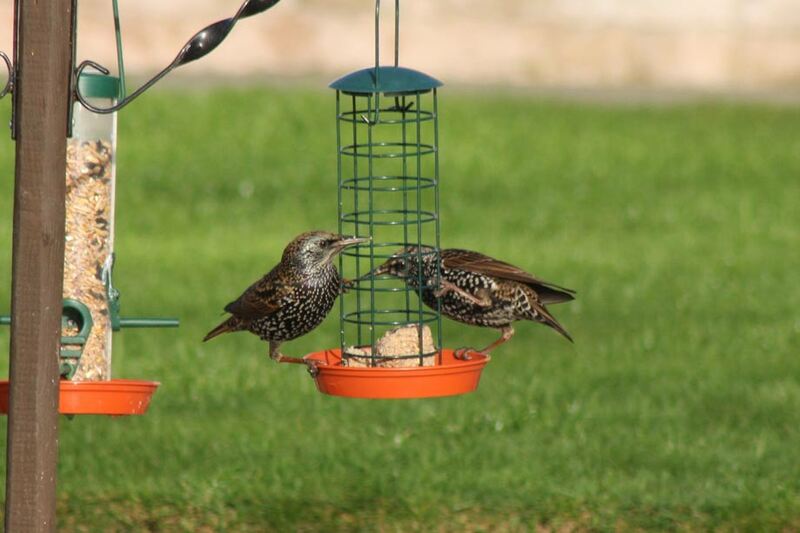 Blackbirds and starlings seem to enjoy the experience most in our garden. 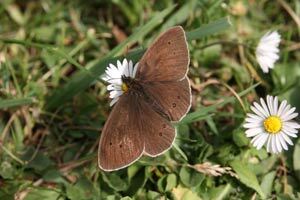 There are many species visiting at present. Wrens are easily identified as the smallest little brown bird with their cocked tail. 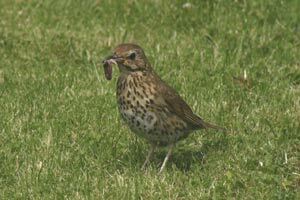 They seem to skulk through the garden under plants and bushes hunting for food. 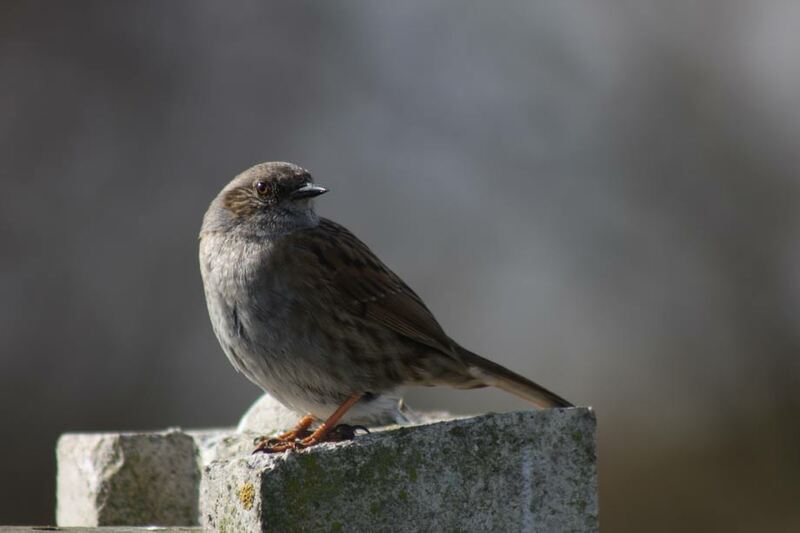 House sparrows are still common and even nest in our roof, and hedge sparrows or dunnocks as they are more commonly known can be seen daily foraging in the undergrowth. Small flocks of starlings with their shimmering coloured feathers are now frequenting the feeders, but we haven’t the huge numbers in the air above Rowton as in previous years. Greenfinches visit the feeders, but we also get siskins, best described as a miniature greenfinch with a dark patch on its head, and the occasional chaffinch and bullfinch. All finches have beaks ideally adapted for prising open seeds, but they will feed on any bird food. Bullfinches are the easiest to identify, being rounder and chubbier, with a black conical bill and black crown on their heads. The male is bright crimson in colour and the female chocolate brown. They have a very soft quiet call, pew or dju, and are quite shy and secretive. Reed buntings also come into the garden in the coldest of winter conditions, but the most surprising visitor of all was a diminutive male merlin. Keep feeding the birds in your garden during these winter months and you will get a great deal of pleasure. You might also be very surprised at what may turn up. Swans are one of the largest and easily identified species of birds in the U.K. They can be found on most bodies of water, and there are three distinct species to be found in the area. 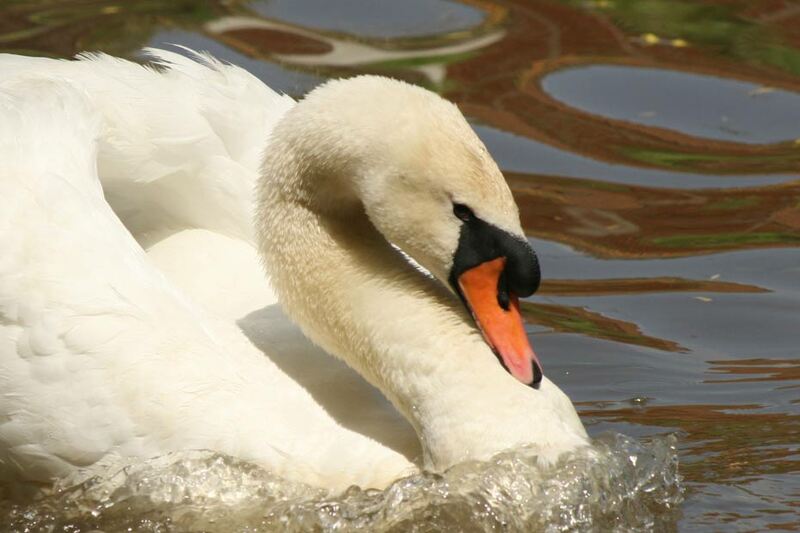 The mute swan is resident on our rivers, ponds and canals, and is named not because it is silent, but because it doesn’t call in flight like the whooper and Bewick swans. It does however make wonderful sounds through its rhythmical wing beats, and can be heard even through double glazing. Mute swans have a red/orange bill and a large black knob on their foreheads. Their cygnets are grey with black bills and don’t become white in colour until they are over 12 months old. The male or cob can weigh up to 16kg, (35lbs) whilst the female is usually around 11kg (28lbs). 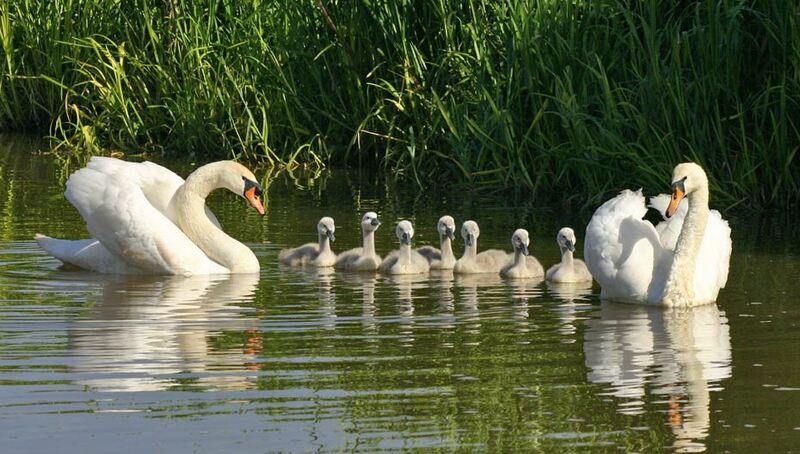 In this area they have an average of 7eggs, with their cygnets usually born in May. The most productive pair are at Christleton Pit. Since 1989 143 eggs have been laid and 125 cygnets born, with 101 surviving to fly in the September of their birth year, a wonderful record and one of the most productive pairs in the UK. Sadly there is a decline in the local population of mute swans with the numbers on the Groves at an all time low. 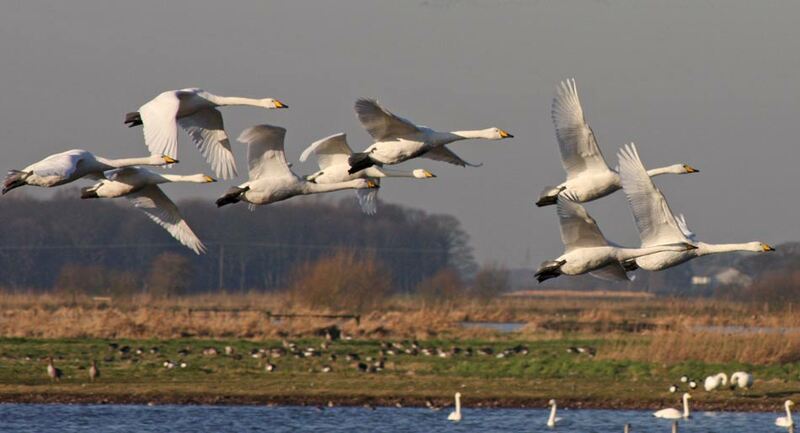 The reasons for this are unclear, but there are compensations, as the numbers of wintering swans on the Dee Marshes from Iceland and Russia have increased from the low hundreds in 2000 to a peak of 268 in 2011. These are mainly whooper swans from Iceland, identified by their size (similar to the mutes, but lighter in weight) and by their bright yellow bills with black tips. 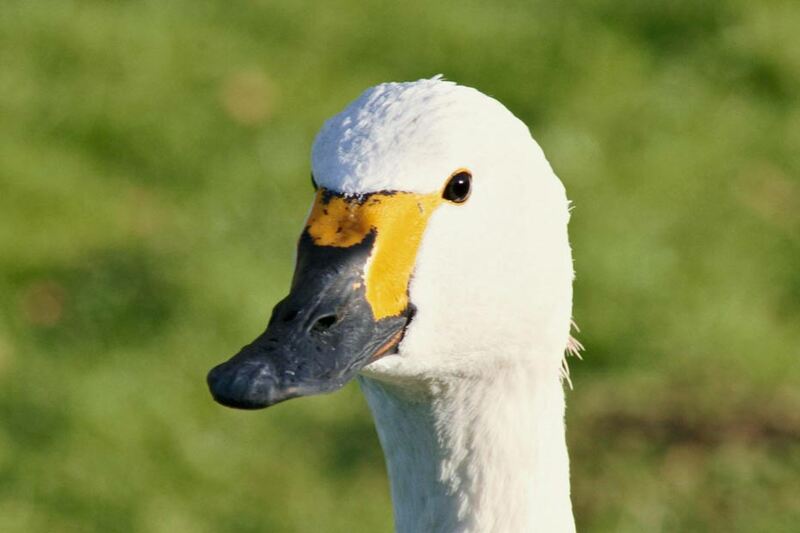 The smaller Bewick swans that arrive from the northern states of Arctic Russia, a flight of over 2,300miles have a wonderful bugle call and also have a yellow bill with black tip, but the variations of their bill patterns make them individually identifiable. Sir Peter Scott first became aware of this characteristic in the 1950’s and a huge study has taken place ever since to identify individuals and families. One of the birds Mrs Noah lived to be over 32 and produced 159eggs. 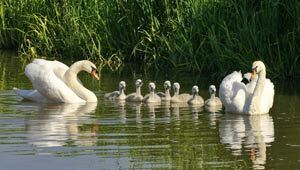 The ability to identify individuals has helped scientists learn so much about the swans, their family life and longevity, and the routes taken from breeding sites to wintering places. Easily the most travelled Bewick seen on the River Dee was ringed in Russia in 1996, and recorded at Martin Mere Lancashire(X5) , Loch Foyle in N. Ireland, the River Dee Estuary at Inner Marsh Farm (X3), Westport Lake Stoke on Trent, Welney & the Ouse Washes in East of Anglia and the Inge Estuary in Denmark. 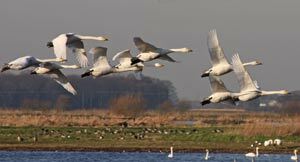 The best sightings of the wild swans can usually be made from the Queensferry to Flint Road, but the swans can often be seen at Inner Marsh Farm or the new Burton Mere RSPB Reserve in Wirral. 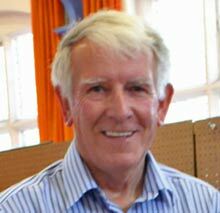 I have been asked recently about the behaviour and habits of squirrels in the Chester area. Do they hibernate? 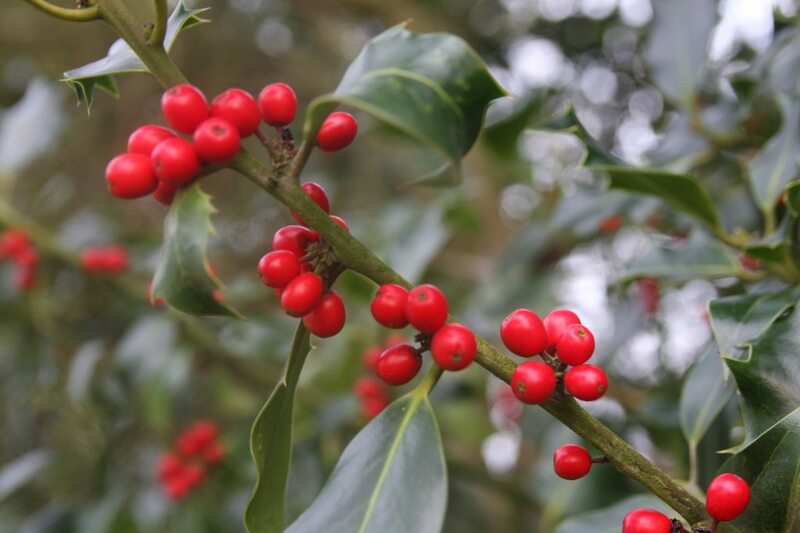 as many have been seen actively looking for food in local parks and gardens, even in January. Are there red squirrels in Grosvenor Park? 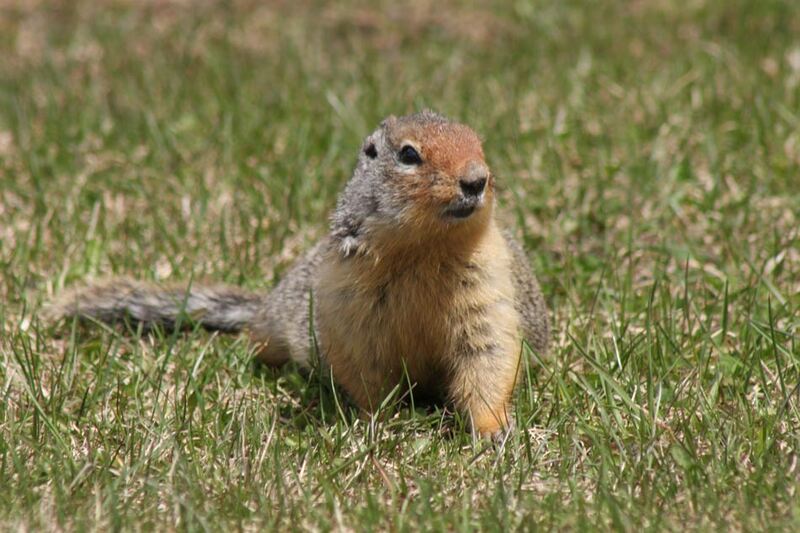 The answer to the first is that they occasionally do, but when the weather is relatively mild as it has been until recently, they will still remain active. The second answer is that there are no red squirrels in Chester, however sometimes colouring can be varied and some greys can have a red tinge to their fur. There are other differences, and size is usually the first thing to notice, greys being the noticeably bigger animals. 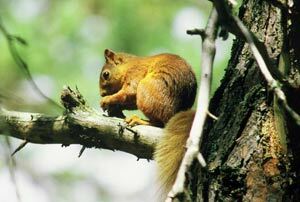 The nearest red squirrel colonies are at Formby Point, Lancashire, and Newborough Forest on Anglesey. 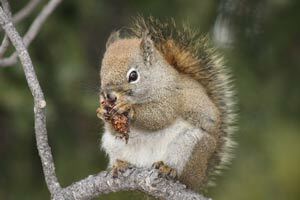 Red squirrels look very petite and usually have a bushy white tail. All squirrels love fir cones, acorns and other seeds, although they will also feed on the buds of trees, fruits, fungi and green plants. Squirrels in the U.K. nest in drays or collections of loosely plaited twigs covered in lots of leaves built in a circular shape rather like a birds nest, with a small entrance hole on the side. 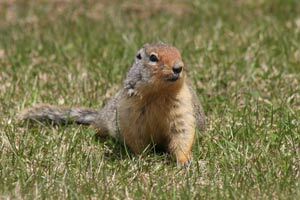 In British Columbia both the native red and Columbian ground squirrel’s nest in holes on the ground, as any tree nest site would be in great danger from the weight of snow and ice during severe winter weather. There is a variety of squirrel known as a black squirrel ( a dark variant of the red) and there are reported to be several colonies in the U.K. I’ve seen them in the Vienna woods, and in the coniferous forest, at Souilliac in France. We tried to get close to the ones we saw in Vienna by tempting them with a square of chocolate, which they were pleased to accept from about a metre away giving us really close up views. My close encounter with the red was at Loch Garten, near the famous Osprey nest site, a classic picture of a contented red squirrel. 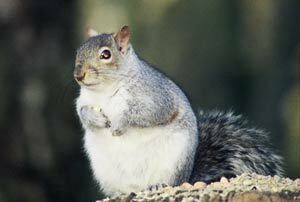 The picture of the grey was taken in Grosvenor Park where they are numerous, and very active. Squirrels breed once or twice a year, and give birth to a varying number of young after six weeks. They have wonderful vision, and have great balance and touch, with the ability to be extremely agile when moving through the tree canopy. The introduced greys have caused problems for our native red species over the last 100 years or so, because they compete for food and tend to win due to their superior size. However the reds are fighting back, and with the support of various voluntary wildlife agencies are being re introduced to many new sites. April is the main month for the influx of our migrant bird species, arriving back in the U.K. after long flights over hazardous terrain, including deserts, high mountains and oceans. Often meeting the additional problem of being shot by unscrupulous individuals on route, or even trapped for food. The first small migrant appearing in this area is usually the sand martin, closely followed by the wheatear, both using rivers and streams such as the Dee or Gowy as flyways as they head over the area, or stop off for feeding before heading even further north. 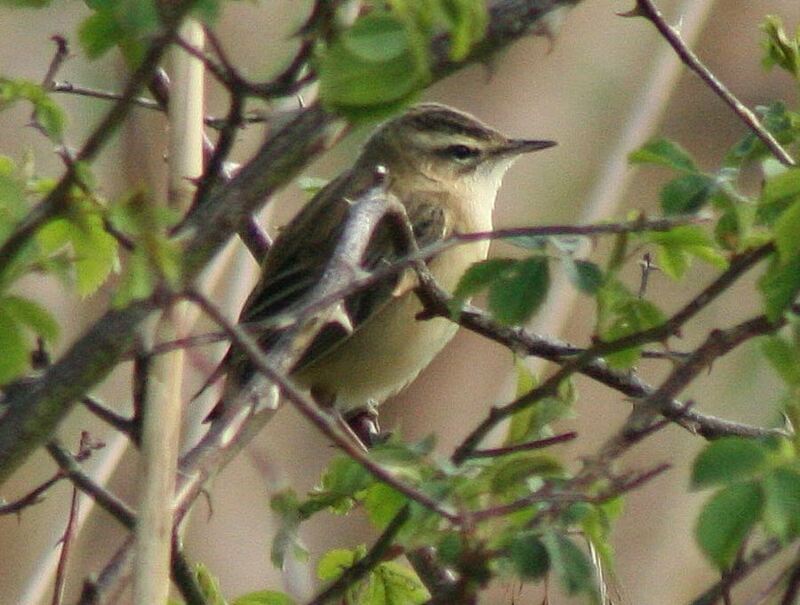 Chiff chaff, diminutive members of the warbler family have probably arrived in mid March and their distinctive chiff chaff call makes them easily identifiable, from the similar looking willow warbler, which has sadly declined in numbers in the Chester area over the last ten years. 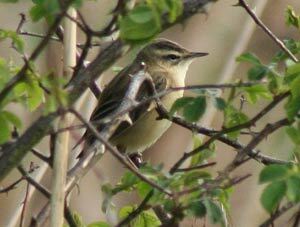 Sedge warblers a small migrant with a distinctive white stripe above the eye and strong zizz like call will also arrive before the end of the month. 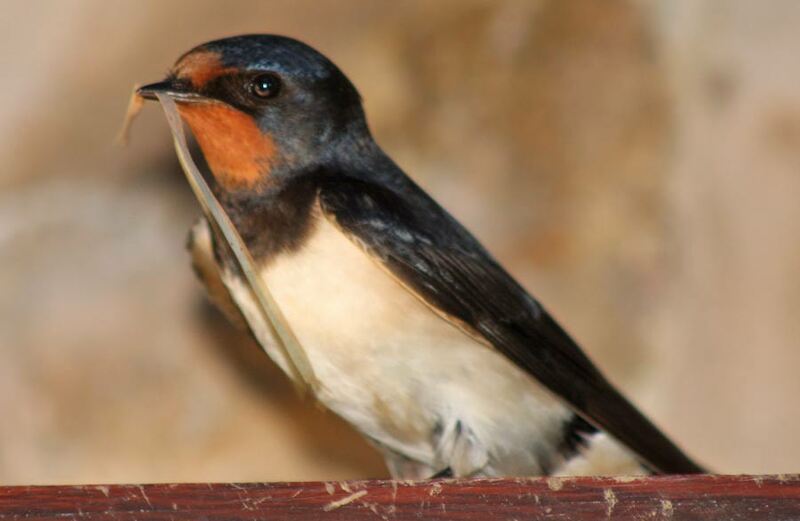 These are followed by good numbers of one of the most elegant of small migrants, the elegant sleek, slim line swallow with its distinctive V shaped streamer tail feathers. 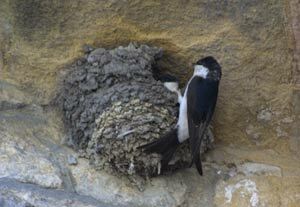 They find lots of nest sites in the area, on houses, in barns and sheds, and collect grass and straw, which they weave with mud and build into their strong concrete like nest structures. The chunkier house martins appearing more black & white than swallows follow later, but they too are decreasing in numbers, although there are distinct groups like the ones at Eaton Hall which amaze visitors on Garden Open Days by their agile flying displays. By early May the much sleeker black and scimitar winged swifts appear in this area, screaming as they fly around, and you can almost set the calendar by them. They arrive on the 7th May and depart on the 7th August. 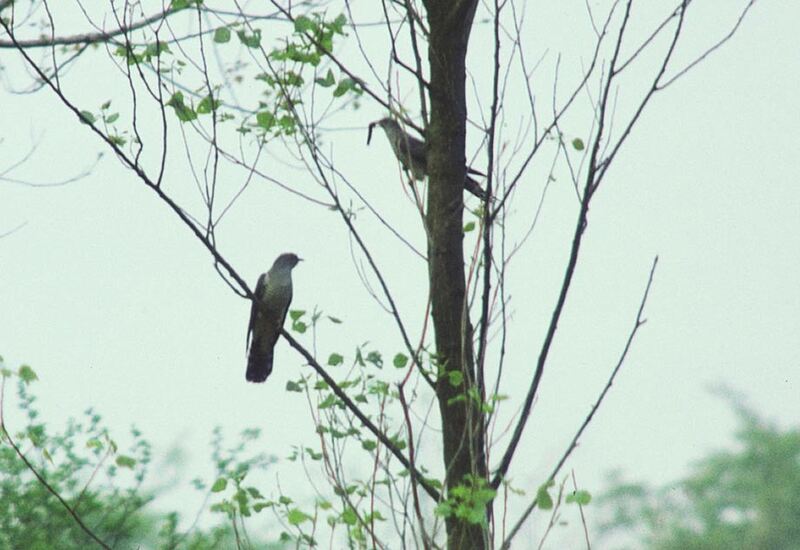 The migrant that has declined most is the cuckoo, a bird that always seemed to herald the coming of spring, but it is now rare to hear these birds at all during the season. 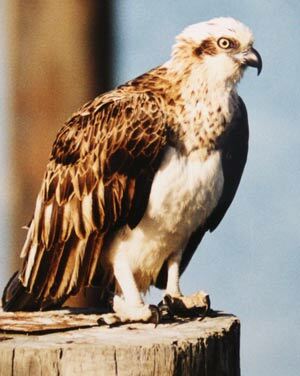 However there are occasional breeding pairs. 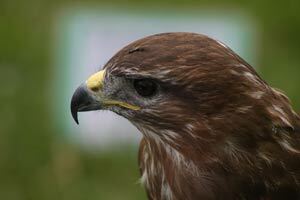 The last pair I saw and heard was at Hockenhull Platts in 2007. Apart from the distinctive call cuckoo-cuckoo, the female also makes a very strange gurgling call when laying, and I guess a reason for their decline is the loss of reed beds, and of smaller bird species like the reed bunting and willow warbler which used to provide ready made nests for their larger aggressive rivals. The following list gives the average date for the arrivals of migrants in this area over the last 10years. 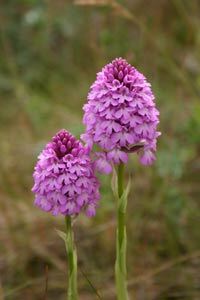 Orchids are a fascinating and beautiful group of plants, and the growth and development of many exotic orchids found at Garden Centre and later displayed and grown in homes, has been a great joy in recent years. 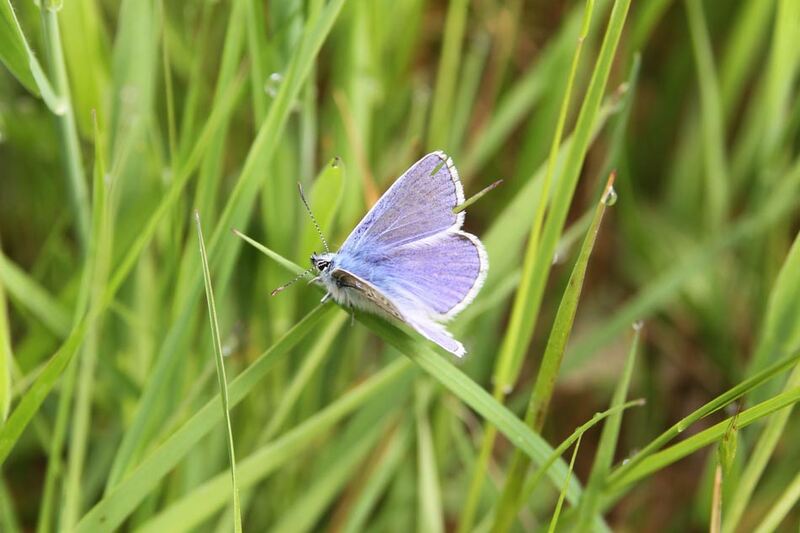 However there are many simpler native species to be found in this region on meadows, roadside verges, sand dunes and in a variety of other habitats. These will soon come into flower for this new season. Parts of Cheshire, Wirral, the outer Dee estuary and Anglesey all have important sites. The most common species in the Chester District are the common spotted, and northern/southern marsh orchids, usually found on wet meadows. 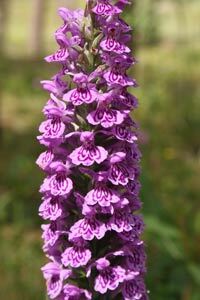 There is also a larger hybridised species with characteristics of both of these tall orchids. A short distance away from Chester, the smaller pyramidal orchid grows in great profusion on several sites. All these orchids can be found in the colour range from pure white, to cream, from pink to deep purple. 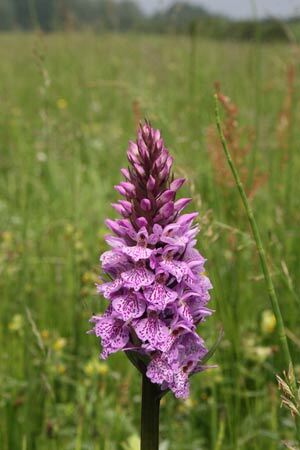 The common spotted orchid, can also be easily identified by having a large number of spots on its long green leaves. Although most native orchids are quite small, some of these hybrids can grow up to 70/80cm tall. 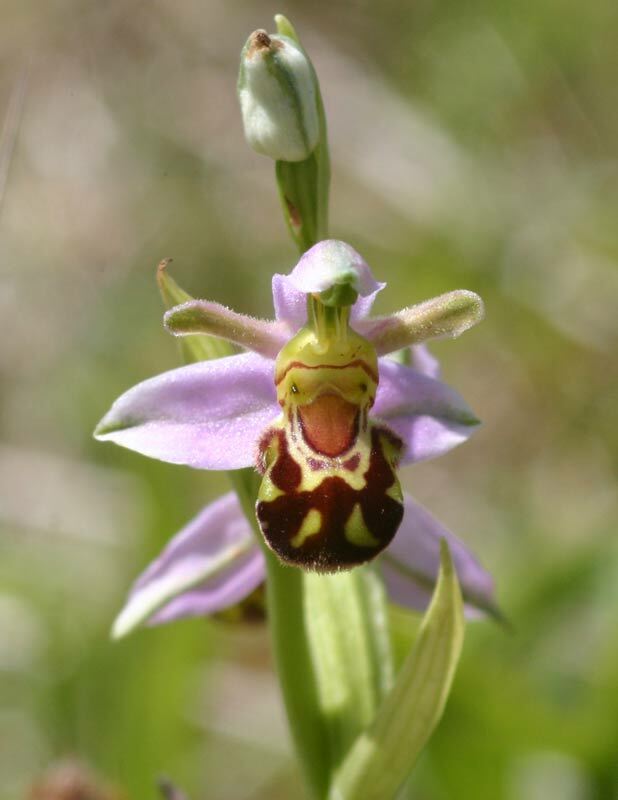 In some isolated spots you can also come across specimens of the delightful bee orchid, which mimics the characteristics of a bumble bee but doesn’t need it for pollination. 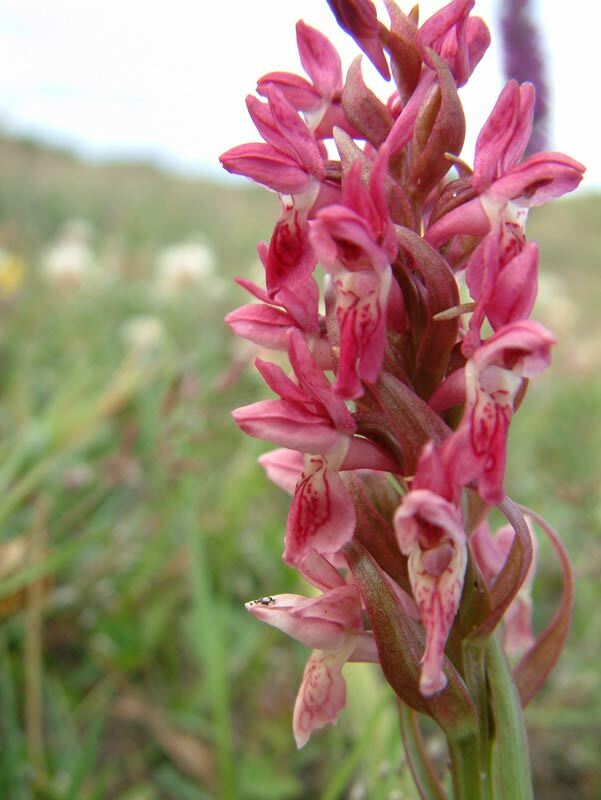 A longer journey to the outer Dee estuary and Anglesey will bring you an even richer variety of orchids, including early marsh, heath spotted & pyramidal orchids, as well as thousands of specimens of marsh & dune helleborines, and tiny ghost like twayblades with their two distinctive leaves. Common spotted and heath orchids can also be found in small numbers on the limestone of the Great Orme. 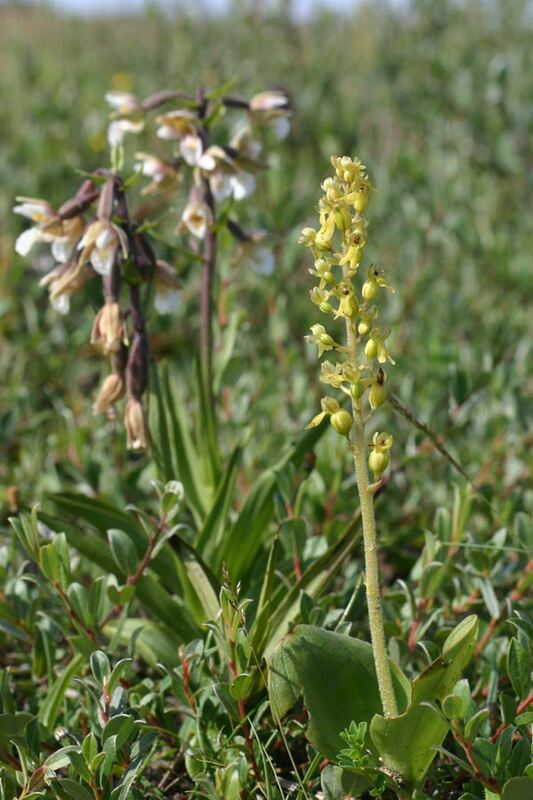 The appearance of orchids can vary from year to year and season to season, but they normally appear in this region between May and September. 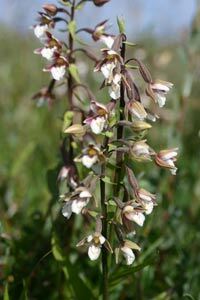 They are much more common than you think, and you can even see them in profusion in spots along the A55 if you know where to look. Just like the emergence of the cowslips which seem to increase in numbers there each year, orchids seem to be spreading in areas where they can grow unaffected by human influence, secure in their roadside habitat until the mowers come along later in the summer. I have been fortunate to find beautiful orchids on my walking holidays in many parts of Europe, but in recent years have been pleasantly surprised by the number of species I’ve now located and photographed in our local area. 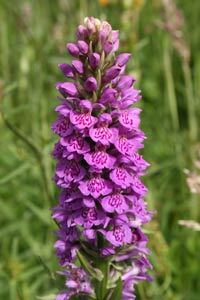 There are said to be 50 orchids on the British list, and I’ve now photographed more than twenty of them. 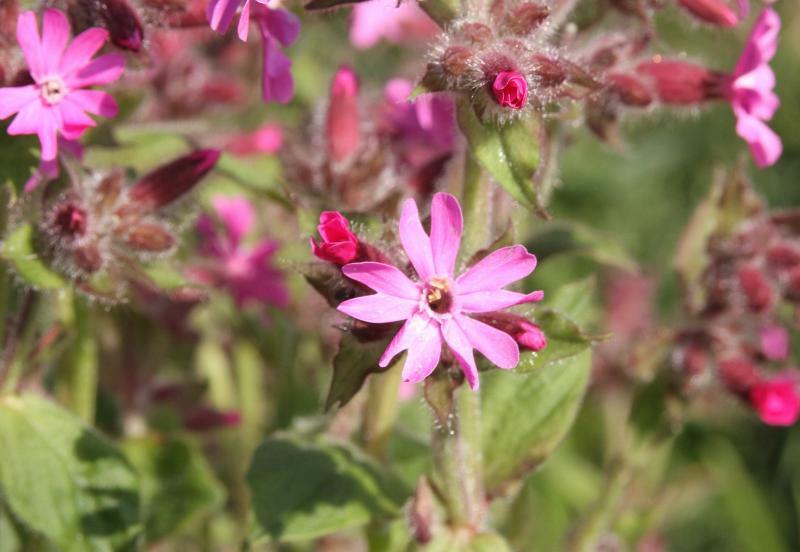 In this month’s Wildlife watch I’ll concentrate on a fascinating local site where many native wild flowers grow. 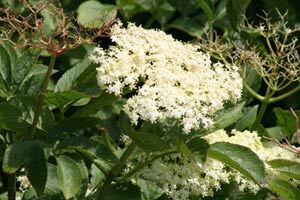 I’ve been warden of the Cheshire Wildlife Trust Nature Reserve at Hockenhull Platts for over forty years, but still get excited at seeing the many native flowering plants that emerge each spring. 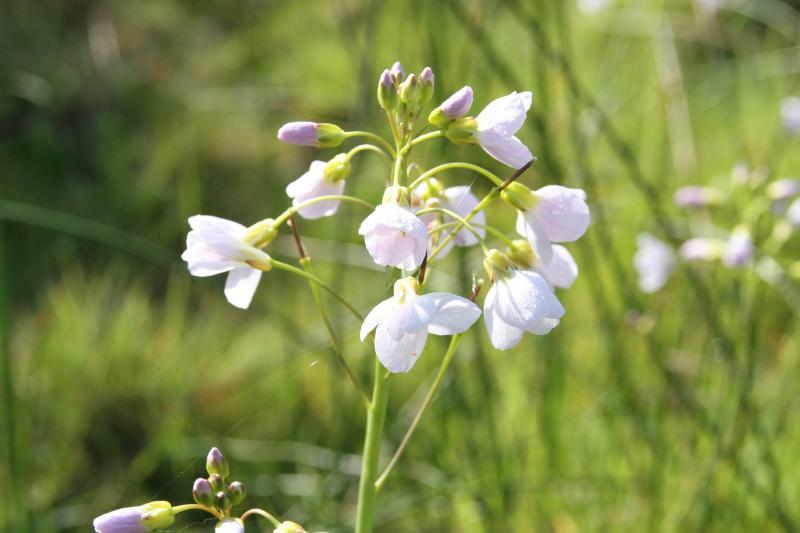 The first to appear is the lady-smock or May flower, a fragile looking plant with a delicate pink-to white colour, and favoured food for the orange tip butterfly. 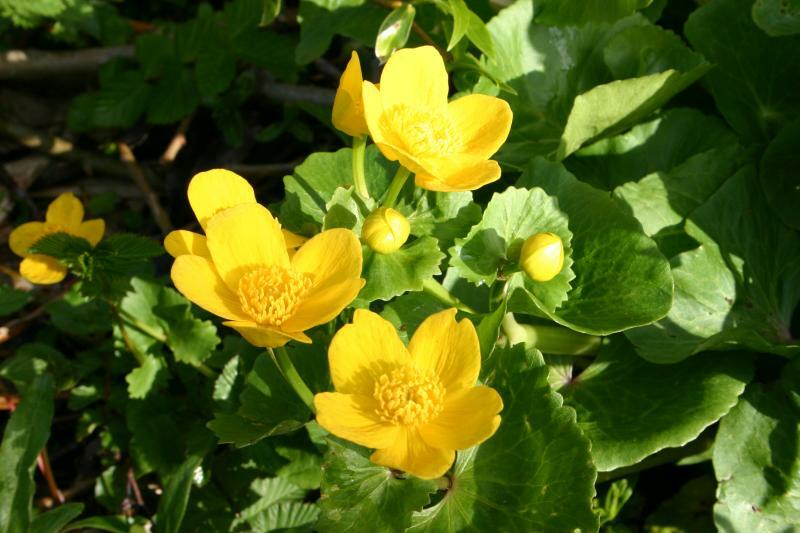 This is closely followed by the bright yellow king cup or marsh marigold. 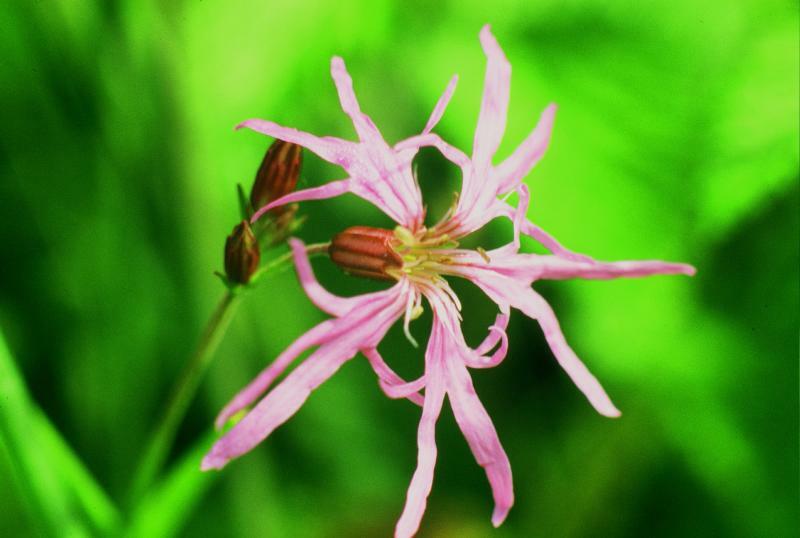 Both of these species are profuse, and are closely followed in the growing season by pink campion, ragged robin, another delicate pink flower that has petals that seem as though they were cut by a scissors, and comfrey, a plant once used for medicinal purposes as it has soothing healing properties. 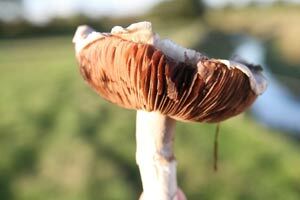 As the season progresses the insect-eating arums appear. They are also called Lords and Ladies or cuckoo pint. 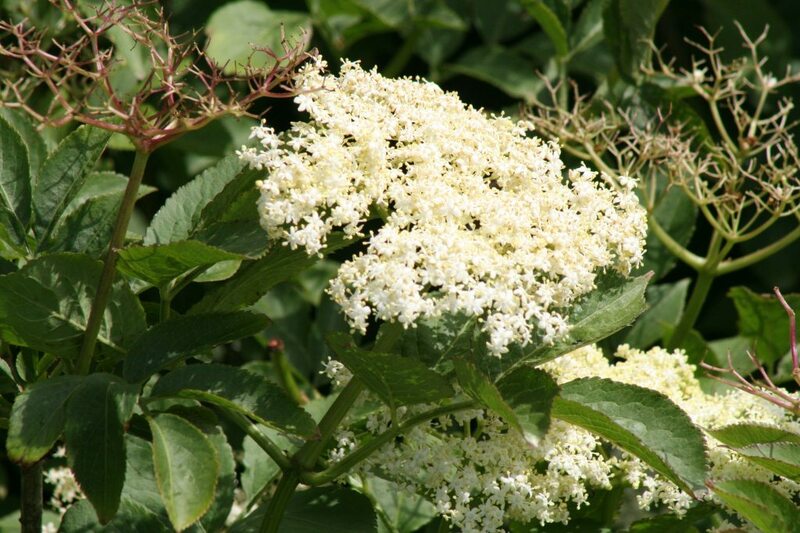 These strange upright plants love the shady conditions under the hedgerows, and devour insects to survive. 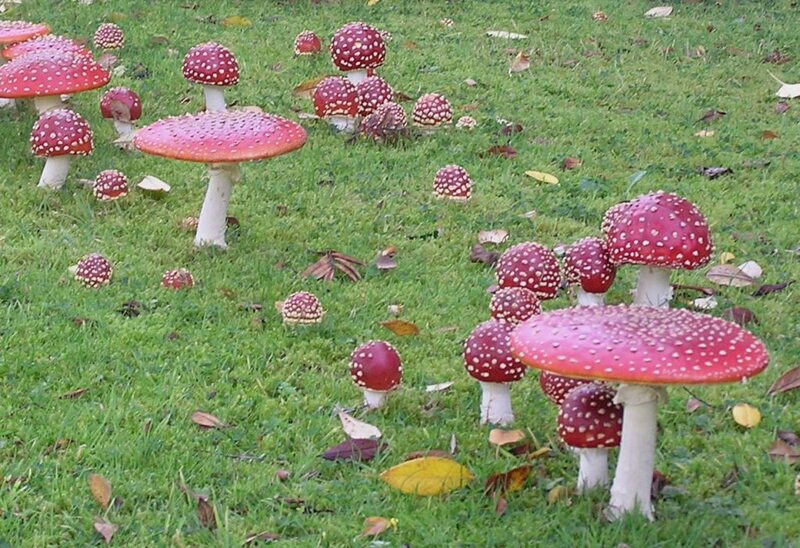 Each has a green sheath which covers a sticky flower spike, which in turn attracts bugs, flies, etc, and as the season progresses, the food is absorbed into the bulb of the plant. 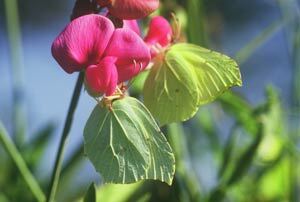 In the autumn the flower loses its protective sheath and a group of green berries appear on the stalk. 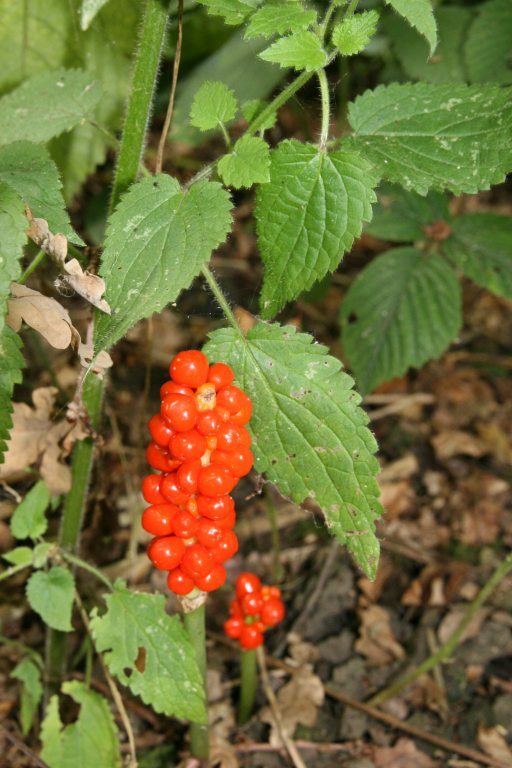 When these ripen to an orangy - red fruit they become attractive to birds, which eat them and then deposit the waste seeds onto another area, which ensures their future survival. 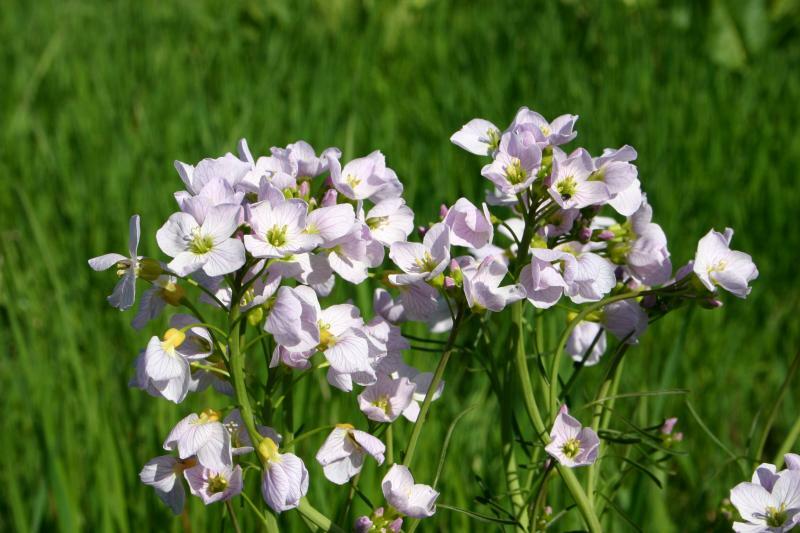 As spring turns into summer, field horsetail, a plant that has survived for millions of years, ribwort plantain, a plant resembling a thin stick of rhubarb, meadow sweet, a tall almond scented plant, and marsh valerian, an even taller pink- mauve coloured flower, take over and dominate the meadow. 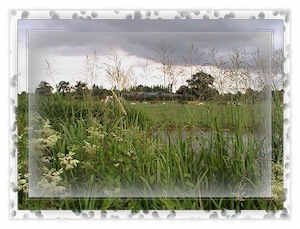 They grow amongst the flowering rushes, including burr reed, sedge and bull rush, and other taller flowering reeds and sweet grasses, together with a myriad of other varieties of plants, some very rare in the UK. 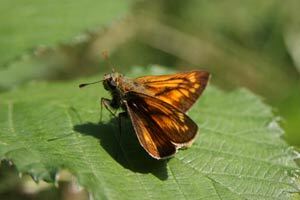 On the drier meadow, marsh thistles, which can grow up to 3ft (1m) tall, begin to dominate the scene amongst the rushes, docks, and meadow grass, and become the food plant of butterflies such as the small skipper. Yellow ragwort, which is poisonous to some animals, appears in summer and is the main food plant of Burdett moths. 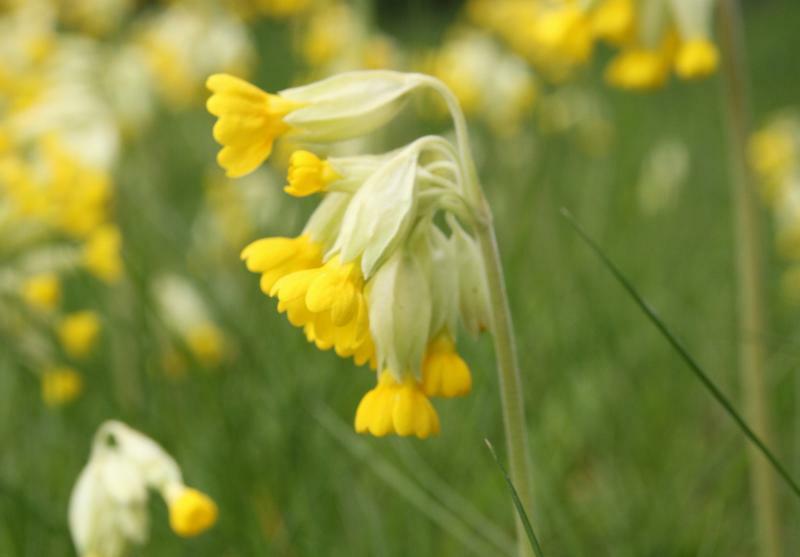 Another attractive yellow native flower, the cowslip, which had become extremely scarce is now making a wonderful comeback, and a small clump now appears magically each spring in a lane adjacent to Hockenhull. These delightful rich yellow flowers with their drooping heads can now be seen in great profusion along the verges of almost every main highway, including the A55 to North Wales, the M40 and M6 Toll. Photographing damselflies & dragonflies in the Chester area is a challenging task, but with luck is quite possible if you know where these wonderful species are likely to be seen. 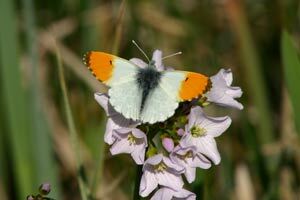 It’s said that 38species can be seen in the UK, with 25 of these in Cheshire. 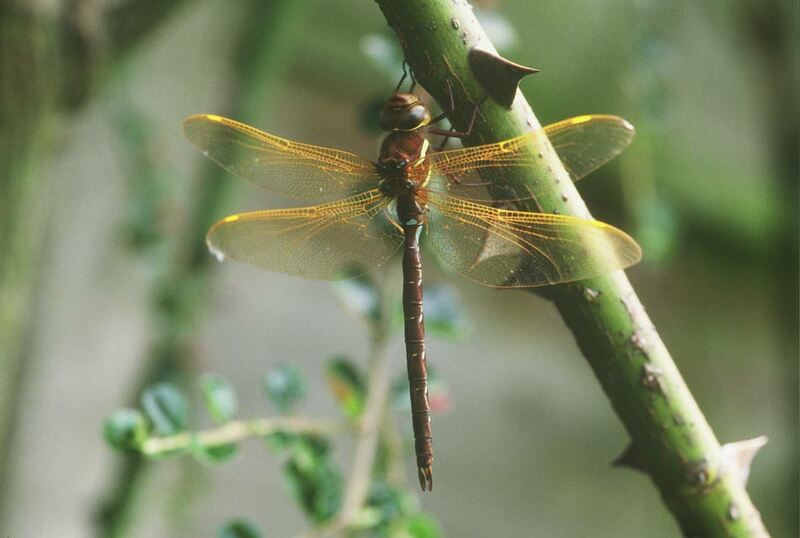 The two biggest to be seen are the brown and southern hawkers, which appear over the canal or marl pits, most usually in July & August. 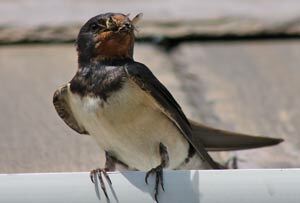 They often come into gardens near the canal to dry out when emerging from their larval stage. 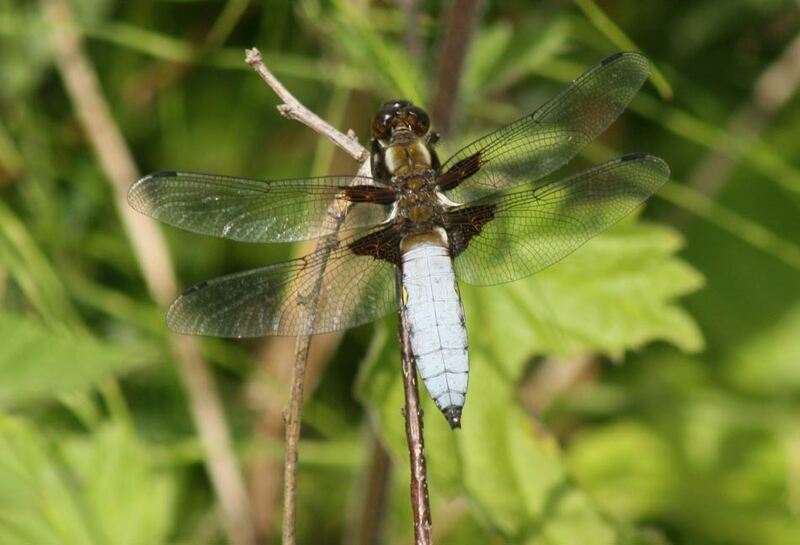 Another large species of dragonfly is the broad bodied chaser with distinctive broad blue (m)/or brown (fm) body. Their large compound eyes give them great advantage when they are chasing their prey with almost 360* vision. 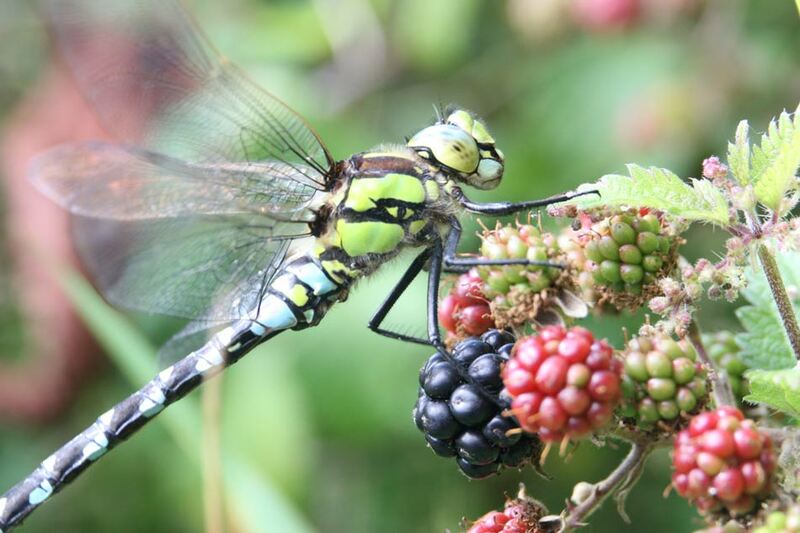 Dragonflies are carnivores eating anything from midges to butterflies, and they are voracious eaters eating 1/3rd of their bodyweight each day. 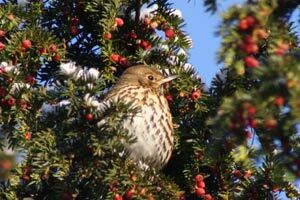 They often roost in hawthorn or conifer hedges and especially like to hang out warming their wings before hunting. 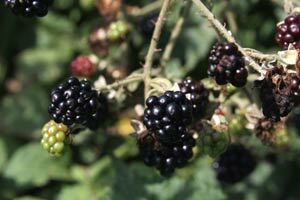 They also seem to like fruit, or perhaps insects that are themselves feeding on fruit like blackberries in the hedgerows. 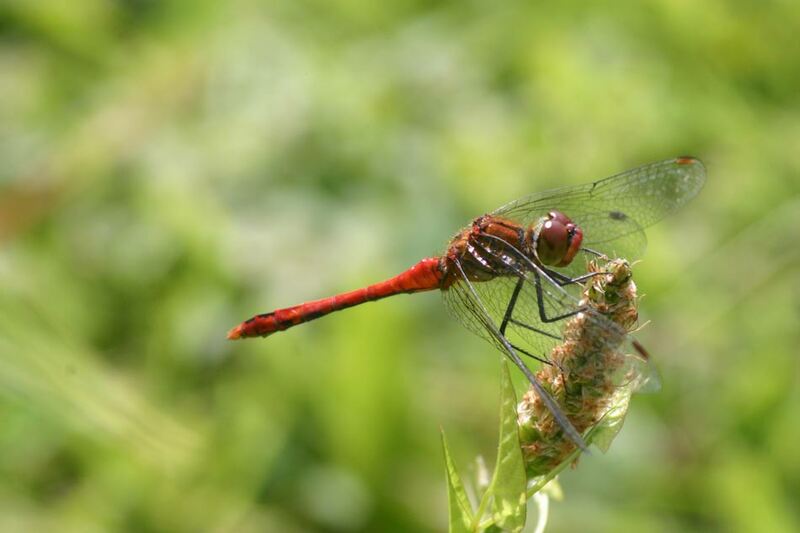 Visitors to Hockenhull or Christleton Pit in summer will often see smaller red darter dragonflies sunning themselves on the stonework of the bridges, on fence posts or on barbed wire. 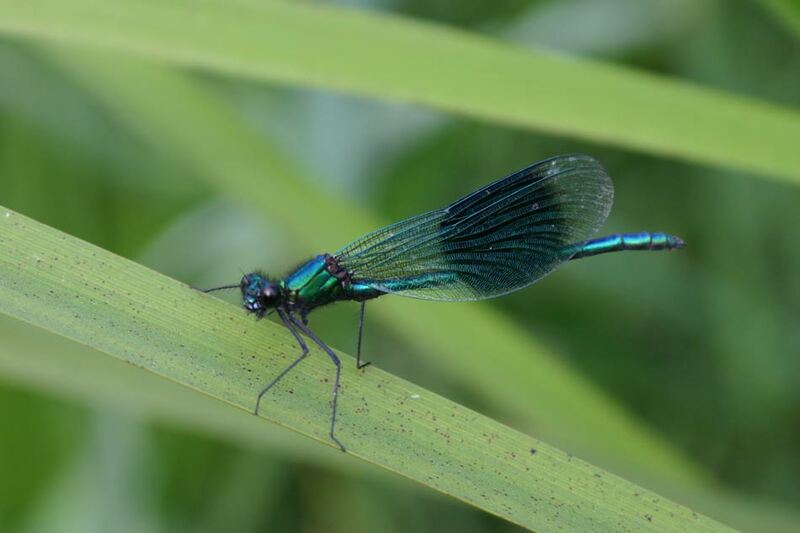 The smaller delicate and highly colourful damselflies are usually seen on plants such as yellow flag iris, or tall reed stems, or in the case of the delightful banded aragon demoiselle, water crowfoot, a floating plant with long drifting stems with white flowers, usually found in the mid stream of the Gowy. The males gather on emerging plants to ferociously defend their territory. 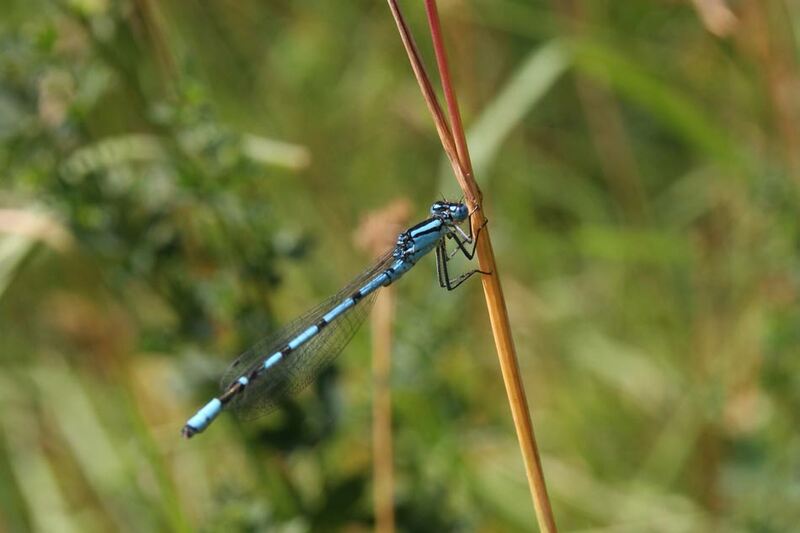 These wonderful iridescent damselflies with distinctive blue spots on their wings are numerous, but are best seen on warm days between May and August, when you might disturb clouds of these wonderful insects if you get too close. On a warm sunny morning during the last week in May we estimated a count of over 500 at Hockenhull Platts. They also have a very distinctive flight pattern, looking like mini flickering helicopters as they fly over the water. 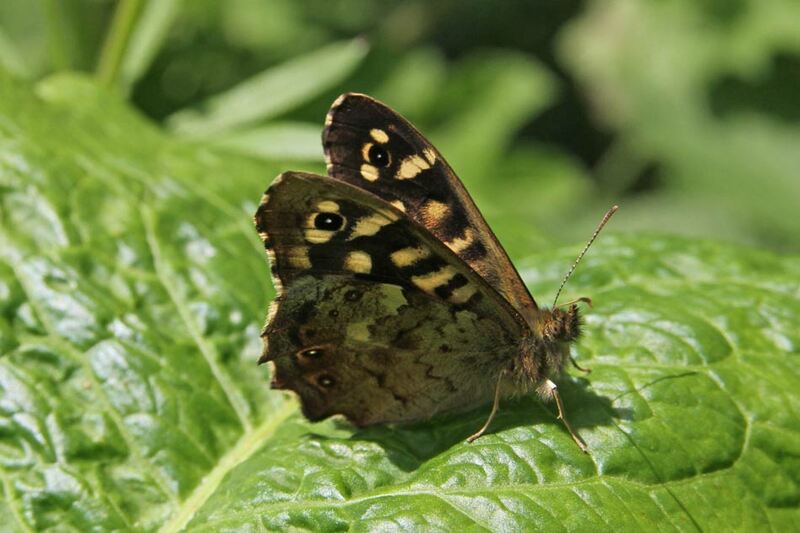 The females are metallic green with clear tinted green wings, and there seems to be a huge and disproportionate ratio of males to females whenever we count them. 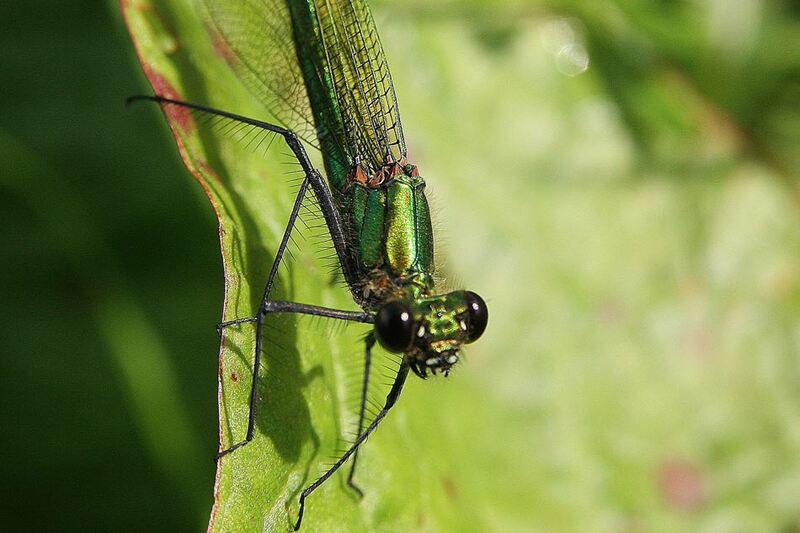 Although they can take up to four years to mature from their egg stage, damselflies only live between two and eight weeks, and dragonflies from three to six. However they are wonderful value for the immense pleasure they can give. In recent years the warm sunny weather spells in early spring has seen the extraordinary flight of dozens of butterflies, all much earlier than usual. The first and rarest has often been the bright yellow brimstone, the species that gave the insect its name, both in Grosvenor Park and along the canal at Rowton. The males and females are quite distinctive, sulphur and pale yellow respectively but they both have wonderful camouflage, and when they are resting, they just look like leaves. Brimstones are one of the longest living butterflies, hatching in August one year, hibernating, and then living until July the following year when they fly with the new generation. The second species to be seen is usually the pretty orange tip, which times its arrival to co-incide with the first growth of the lady smock, also known as the May or cuckoo flower. 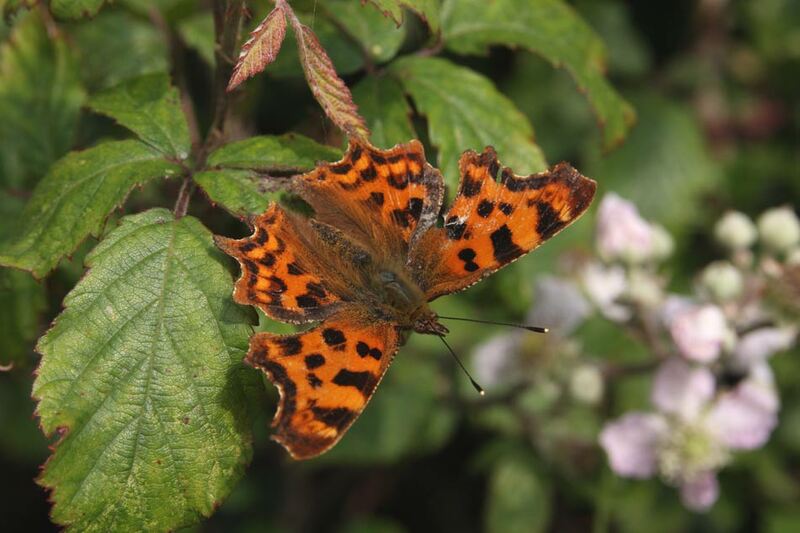 This year these beautiful creatures were joined by a large number of tortoishell, peacock, comma, and even a red admiral. Some of these species hibernate in garages or sheds, and a tortoishell once appeared flying around inside St James’ Christleton in January. Sadly the rain and poor weather through June & July this year has meant that the eggs haven’t developed and this year’s young have been largely lost. In June last year I had seen the most spectacular number of species on the reserve at Hockenhull. 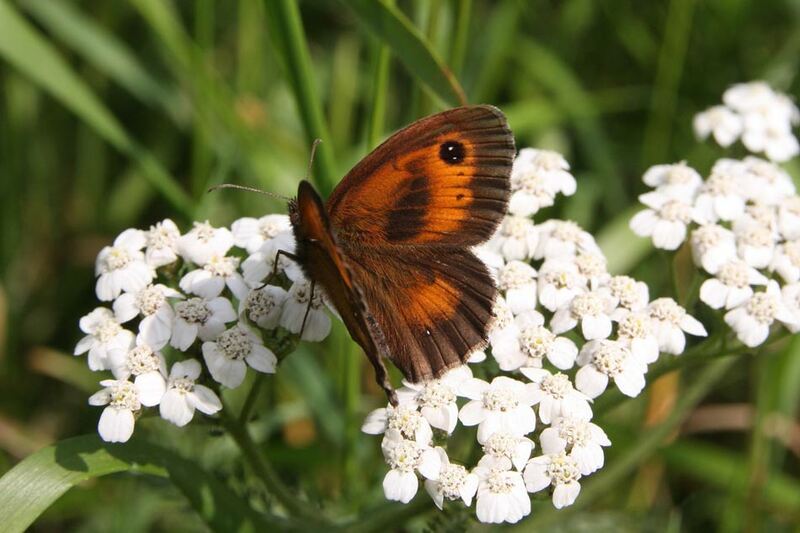 200 Successful broods of holly blue, speckled wood, meadow brown, gatekeeper, skipper, peacock, red admiral, tortoishell, comma and most special of all, several ringlets. There was also the appearance of a number of painted ladies. 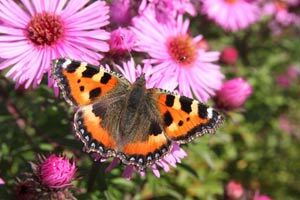 These superb flying insects have “eruption years”, when large numbers fly from Morocco to England via Spain, Portugal and France. 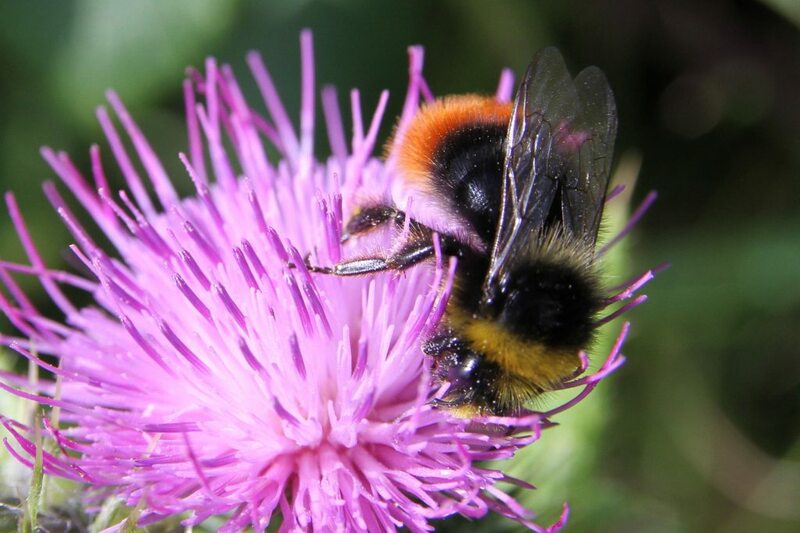 The last time they were here in profusion was 2009, when it’s estimated that 10million of these creatures arrived to breed in the UK. 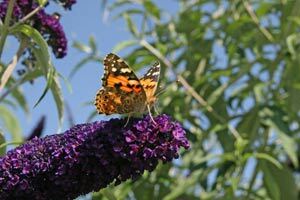 Clouds of them could be seen feeding on buddleia bushes, which is their favoured plant. 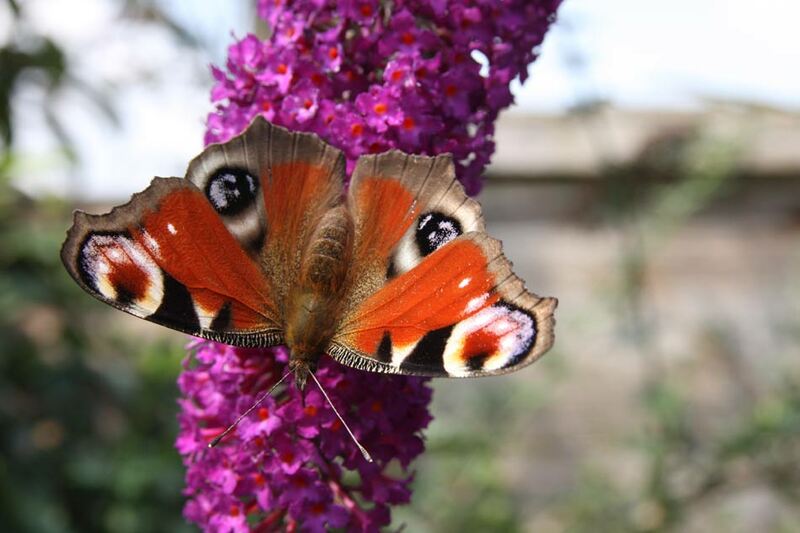 There are many interesting plants that attract butterflies and other insects, but two of the best are the various colours of buddleia (davidii), and red valerian, both of which can be seen at their best in and around the area in June/July. The buddleia is commonly known as the butterfly bush, and is the ideal plant to encourage butterflies to visit your garden. 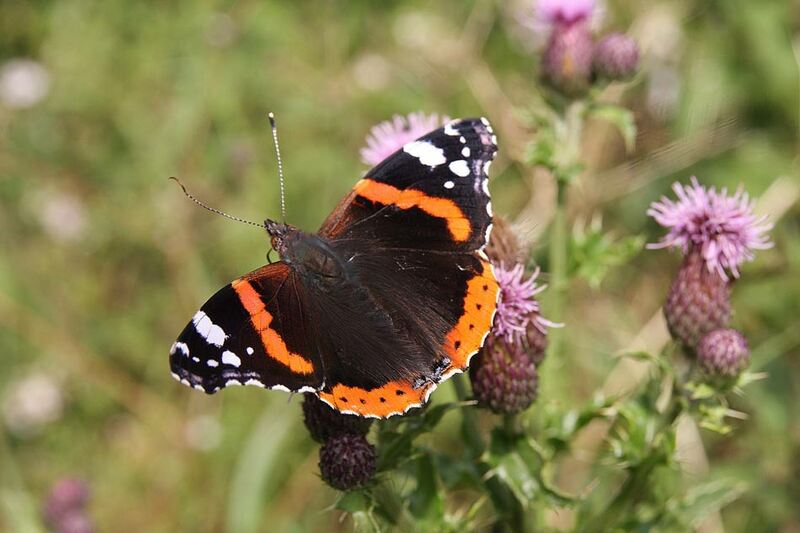 The sight of tens of butterflies feeding on its nectar at one time will bring great pleasure. I’ve just been sitting in a queue of traffic held up by road works in Chester, and watched a male sparrow hawk hunting swifts in the sky over Boughton. 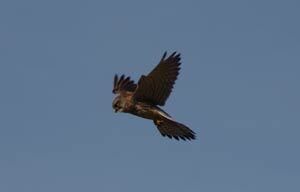 I’m not sure that even the sparrow hawk is fast enough to catch a swift. However it made me think about birds of prey overhead, because 25years ago I could not have written this article. Birds of prey are now very common in the skies above us. 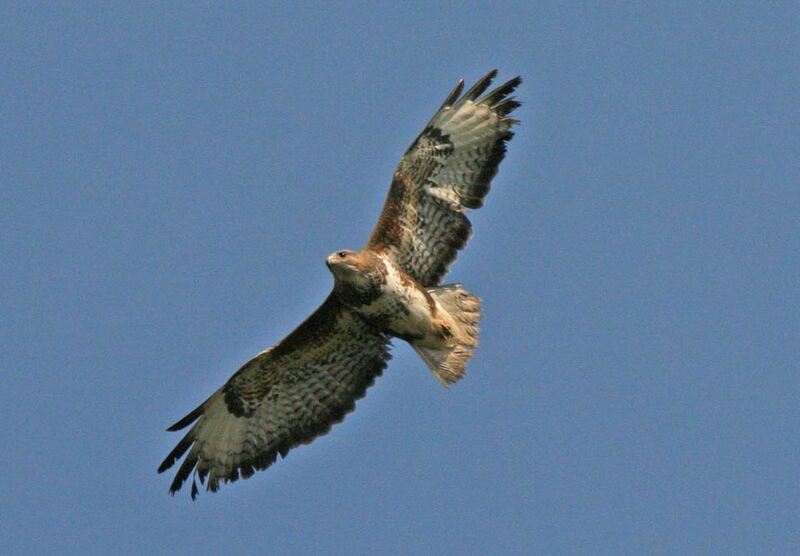 Majestic buzzards with their huge wingspan are everywhere, just look up and you’ll probably see one soaring on a thermal, or perhaps hearing its mew like call. 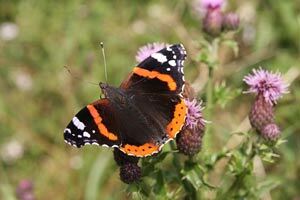 A good place to see them is near the Sainsbury’s “Experience” (formerly roundabout), or anywhere in Rowton or Christleton. The much smaller and more familiar kestrels are usually seen sitting on telegraph posts, or hovering over prey at the roadside, although interestingly buzzards are now using a similar strategy. Over the past two years both red kites and osprey have been seen as passage birds along the A41. 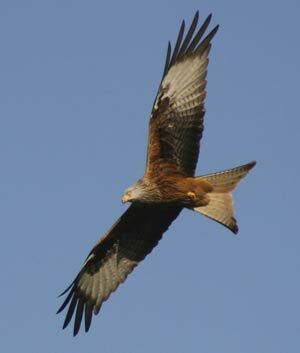 Red kites have gradually recovered from the disastrous days of the 1960’s when they were down to seven males and one breeding female, but can now, thanks to the intervention of the RSPB and many enthusiasts, be seen in huge numbers in many places, particularly along the M40 through the Chilterns, in Mid Wales, Yorkshire and Scotland. Osprey, spectacular fish eating eagles are now breeding in both the Lake District & North Wales, having spread from nest sites in Scotland where the first site of their recovery at Loch Garten, still remains a wonderful site to see them. I called in at the Dyfi Osprey nest site in mid Wales a week or so ago and the one surviving chick was still doing well. 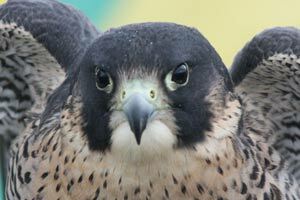 You might have seen its dramatic life story being told on BBC TV Springwatch. Both the adult birds and their chick will migrate to Africa for the winter, but it’s the Scottish birds that probably overfly the Chester area on their route sout,h like the one I saw over the A41 at Handley in Oct. 2009. The Dee marshes remain a good site to see a variety of birds of prey especially on high tides, including the fast flying hobby. However they can sometimes be seen away from the marsh as a male hobby appeared in my garden at Rowton a few years ago. 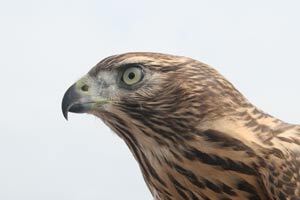 I have also had reports of the very secretive and fast flying goshawk being seen over villages on the east side of Chester, and almost the final part of our local birds of prey jigsaw is that the magnificent marsh harrier has now bred within ten miles of Chester in the last three years. What a change in fortune for this wonderful group of birds! Autumn is a season when the countryside is full of natural food sources for our wildlife, and even ourselves. Who can resist collecting juicy blackberries, damsons, nuts or crab apples from the hedgerows. 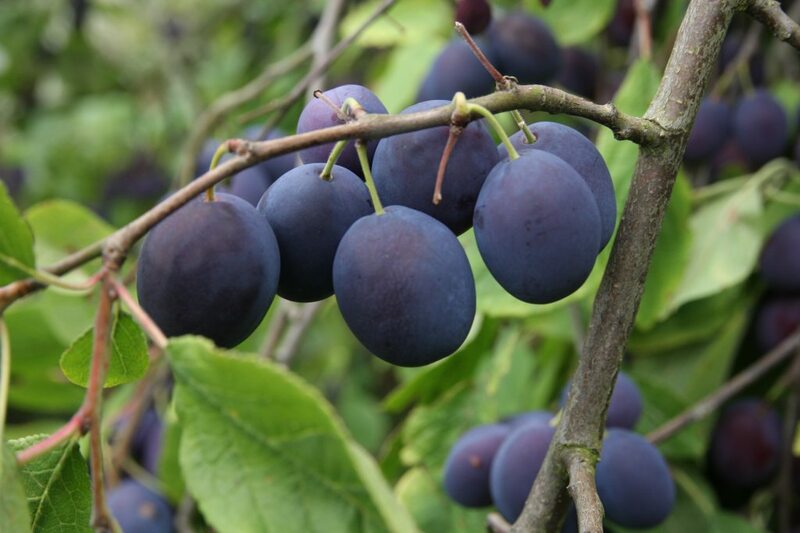 Damsons with their rich purple colour were very useful in Victorian times, and its said that orchards of damson trees were planted in villages all over Cheshire to provide purple dye for the silk industry at Macclesfield. Whilst we might make pies or wine from our fruits, wildlife is busy using them to store up energy for the winter. At this time there is such a plentiful supply of natural sugar and nectar, and although we have had a very poor summer, fruits and seeds are available in huge quantities. Late flowering plants such as michaelmas daisies and sunflowers are an excellent source of food, as can be seen from the pictures. 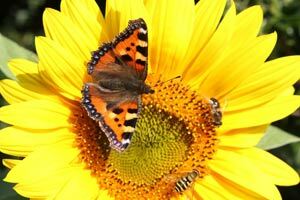 Here at Rowton late emerging butterflies together with a variety of bee species have been in a feeding frenzy on the flowers in our garden. Six tortoishells and a red admiral could be seen earlier today in the warm morning sun feeding on these purple flowers. 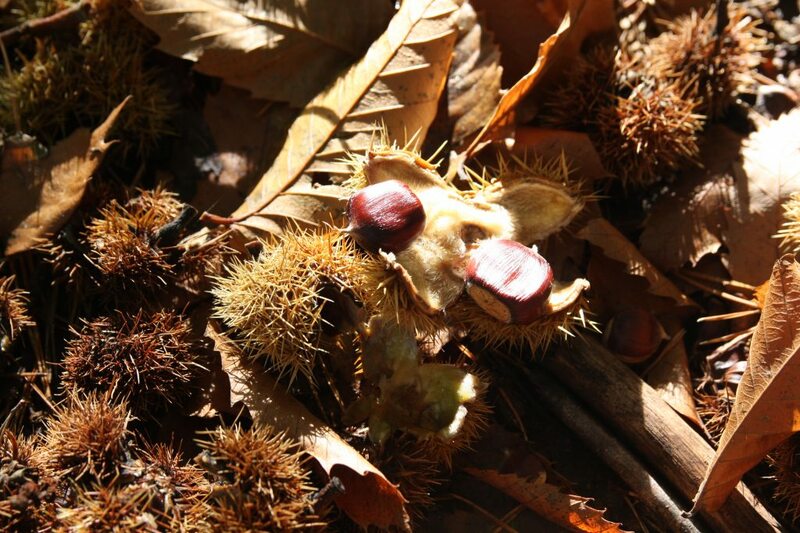 Seeds such as those from the cottoneaster bush also have their uses and many birds will use their specially adapted bills for tearing them open, finches in particular. Although the crossbill is a rare bird in Chester, you can see these unusual crossed beaked birds feeding on cones at places nearby like Clocaenog Forest or at World’s End above Llangollen. 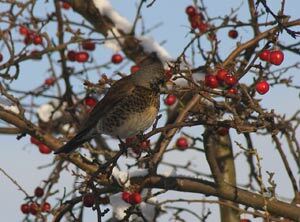 All bird species however seem to enjoy hawthorn berries, and the early arriving wintering thrushes from Scandinavia, fieldfare and redwing will strip a complete hedgerow in just a few days. On occasions bitter weather of the arctic autumn will drive the rare and beautiful waxwings down into the UK. 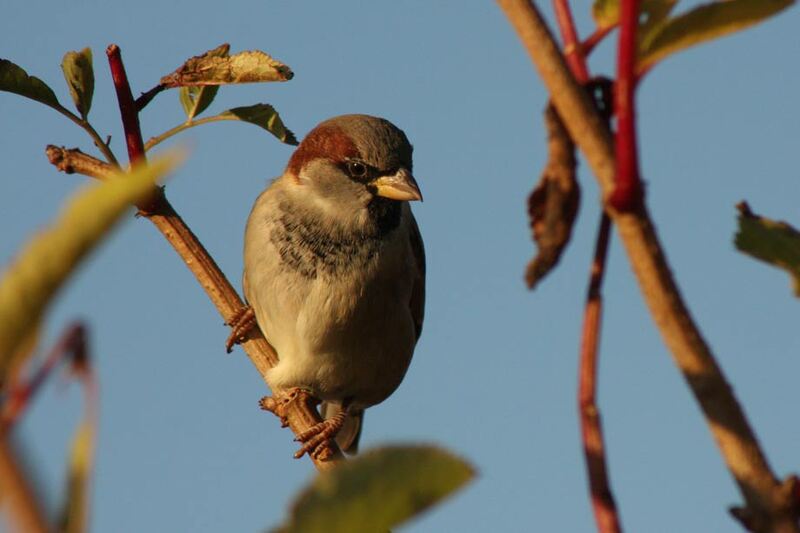 These delightful pinkish brown birds with a wonderful swept back crest on their heads, usually appear near supermarkets, because most have a large number of ornamental rowan trees on their boundary edges. Sainsbury’s at Boughton is a very good example, and the birds are often completely oblivious of the watching public as they feed. 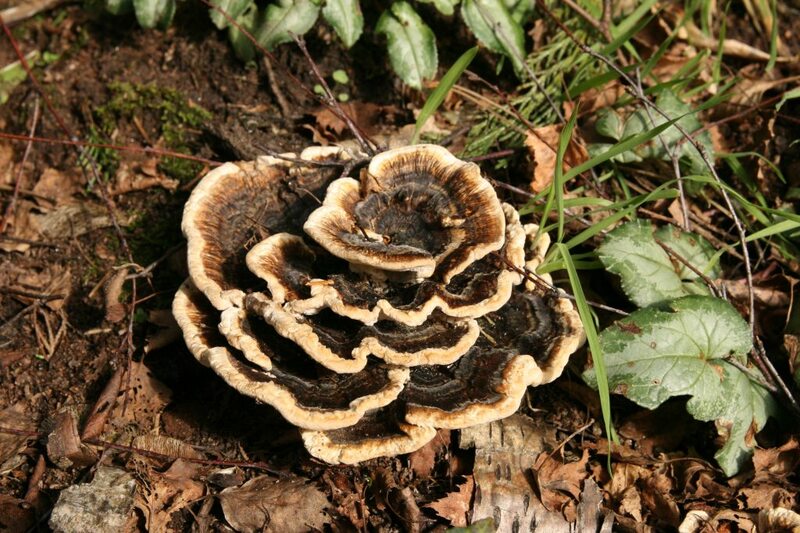 At this time of year most of our woodland areas contain a huge variety of mushrooms or fungi. 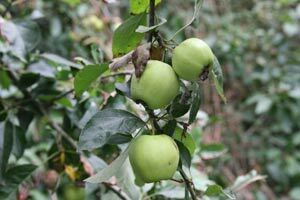 When the weather has been damp it usually indicates that there will be a good crop. 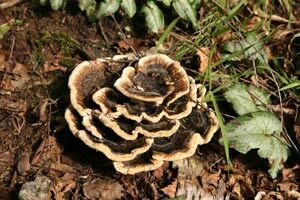 Two of the best sites in the Chester area are at Bickerton Hill and Delamere Forest, and the best time to find fungi are from October to December. 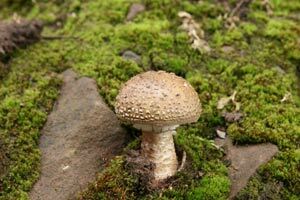 Identification even by an expert can be very difficult, so great care should always be taken when handling these species, as many can be poisonous. 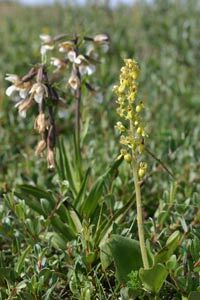 However they can be extremely interesting when seen close up, and can vary enormously with thousands of species to be found. I found some field mushrooms locally this weekend, but they are now less common than in the past, when such mushrooms could be found in great quantities in fields especially when horses had been kept there. 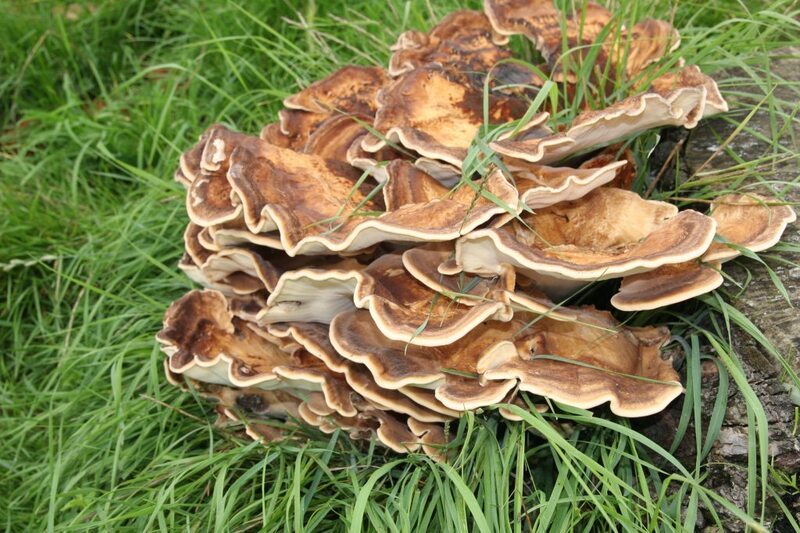 There is nothing like a plate of freshly picked fried field mushrooms with smoky bacon for breakfast!! Fungi unlike flowering plants do not contain chlorophyll and so cannot live by photosynthesis. Instead they live by breaking down organic matter in the soil. 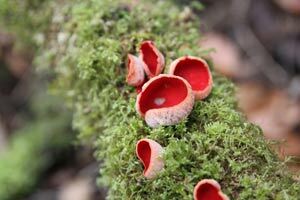 By doing so they reintroduce life giving nutrients into the ecosystem. The parts of the mushroom or fungi we see are the fruiting bodies which appear only for a short time. 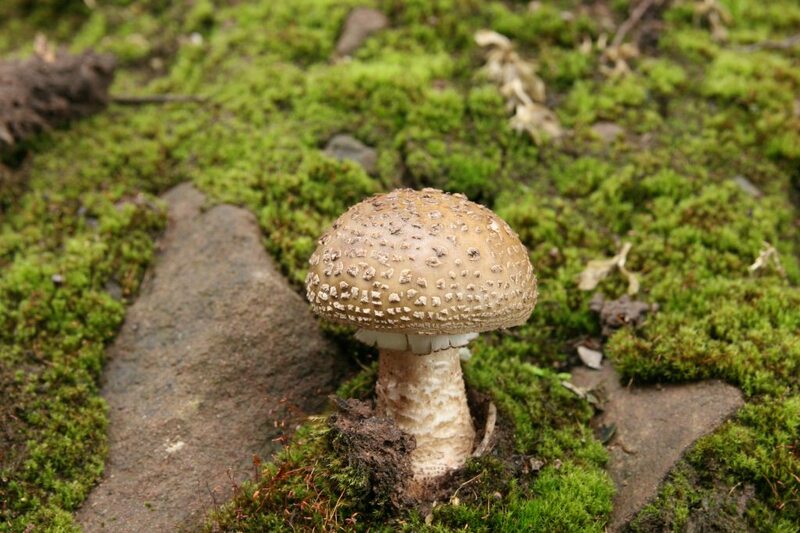 The main part of the mushroom or fungi lives under the ground, or is attached to wood. 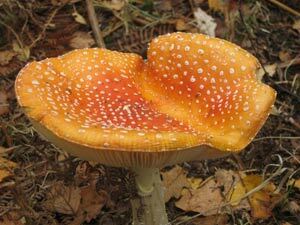 All produce spores on the underside of the cap, which fall by gravity. 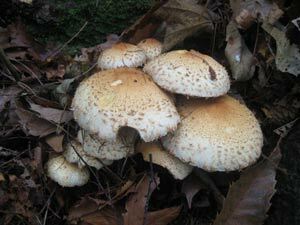 The spore bearing structures may be gills, spines or pores. Almost inevitably the presence of bracket fungi, on a tree indicates that the latter is dying. 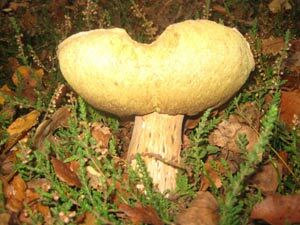 Fungi can be found in a wide variety of shapes and colours, and as I mentioned before identification is often quite difficult. The examples I’ve shown are amongst the most common in this area. 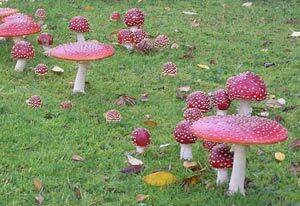 The most poisonous however is the most attractive, and the little red and white spotted mushroom (fly agaric) often used to illustrate the species in children’s storybooks is one of the worst. 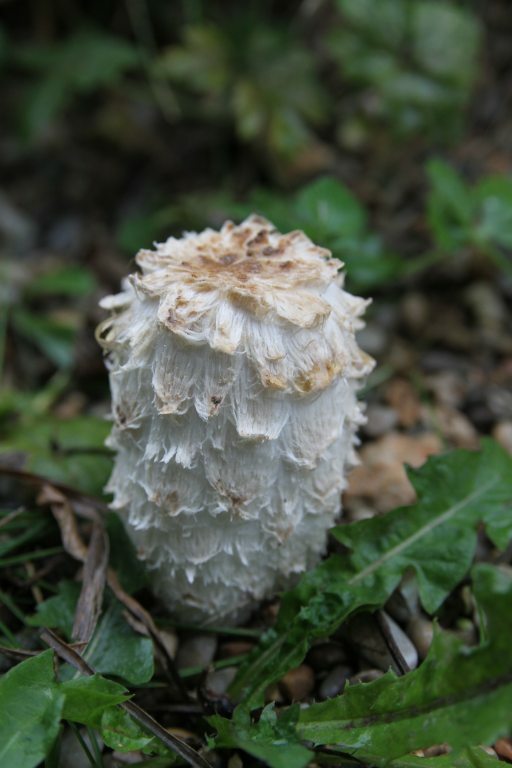 The shaggy ink cap is one of the easiest to identify, and when it matures it looks like a parasol, and its gills become very black, oozing out a liquid, which looks like ink. 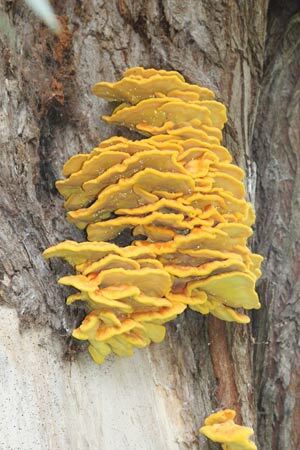 A large yellow fungus growing on trees is a type of bracket fungi called chicken in the woods, but its presence indicates that the tree is unhealthy. The tiniest example shown the scarlet elf cap is edible, but I have only ever seen one or two examples of this species, and this on rotting wood. 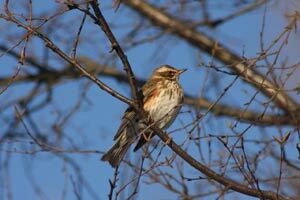 Anyone walking in the countryside at this time of year is likely to come across good numbers of redwing and fieldfare, wintering thrushes that can be seen either in trees or hedgerows, or flying fairly low in the sky just above tree top height. They are often in flocks numbering hundreds, and the birds themselves are physically large in comparison with other wintering flocks of finches, titmice etc. 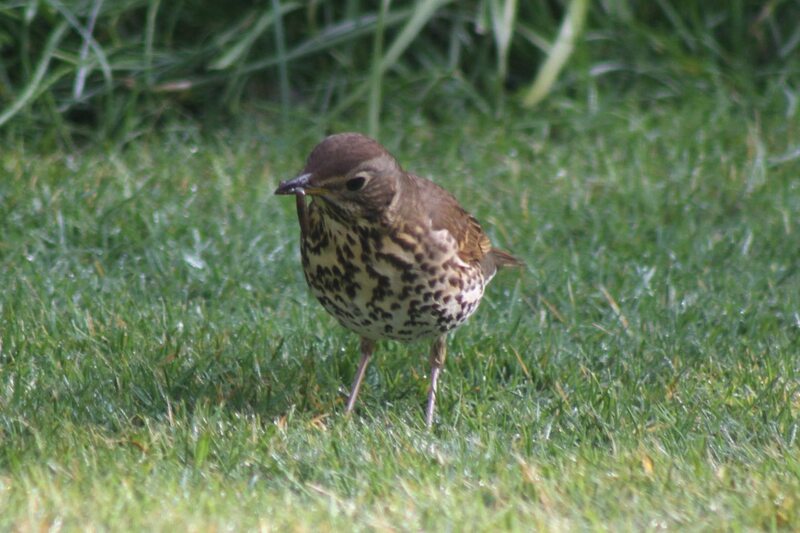 Both redwing and fieldfare, the wintering thrushes, are migrants to the UK from Scandinavia and can be seen between early November and March. They are quite shy birds and will fly away as you walk towards them, often flying just a short distance to another group of trees or into nearly fields to forage on the ground. 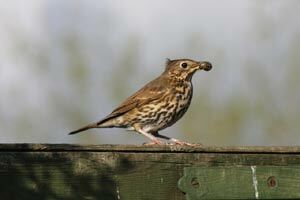 Redwings are similar in size to our native song thrush, but have a distinctive white stripe above the eye. 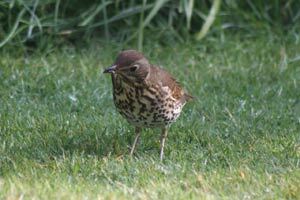 They also have a similar breast pattern of speckled brown stripes to the song thrush, whereas the accompanying fieldfare are slightly bigger, are much more colourful, and have a distinctive chack chack call when they fly overhead. Fieldfare are not quite as big as our native mistle thrushes, which tend to be seen as lone birds or occasionally in pairs, and have a habit of standing almost upright on overhead wires, lamp posts or conifer tops. The song thrush also likes high points to sing from, and their magnificent song can usually be heard from March to June from the tops of roofs or television aerials, often competing with blackbirds for the most colourful territorial song. Song thrushes have had a difficult time in the last ten years or so, but are now on the increase, and will come into gardens at almost anytime of year. Finding broken snail shells on steps or paving flags is a sure sign of their presence, whilst they are also partial to eating slugs and worms. 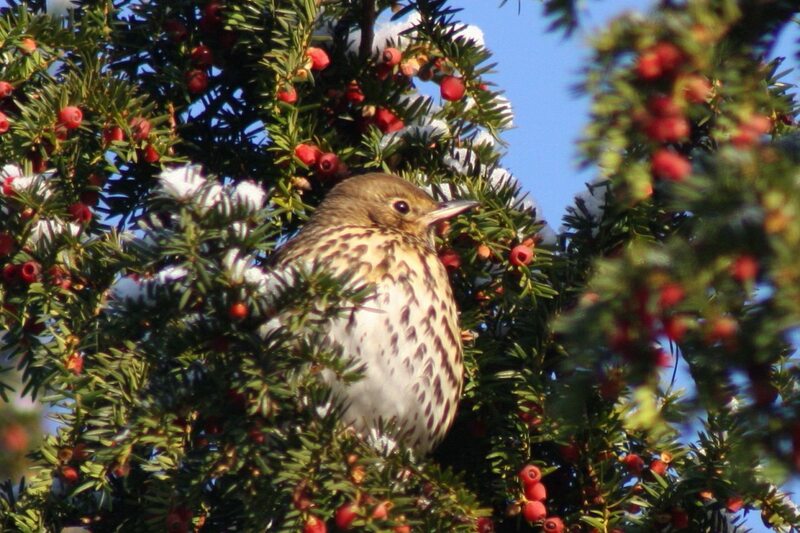 In the coldest part of winter when all the hedgerows have been stripped and food is in short supply, all members of the thrush family will, as a last resort, tackle yew berries in churchyards. 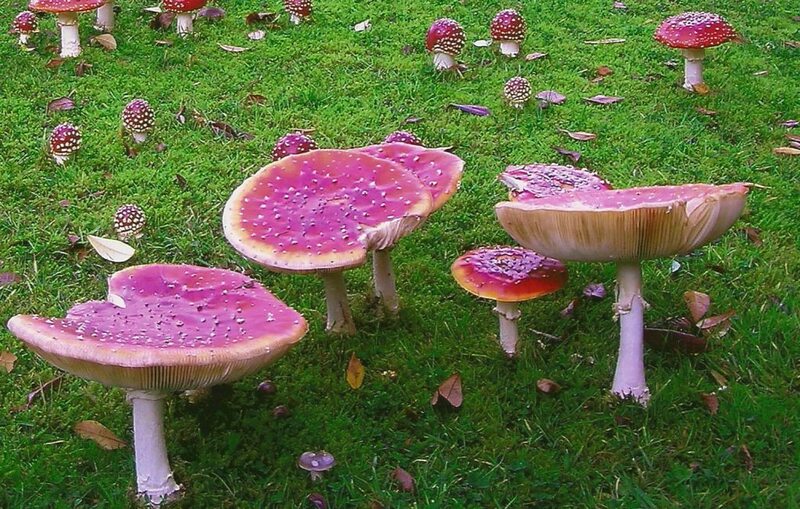 However even then they are very selective and eat the hard seeds from inside, rather than the outer skin and bitter pink flesh, which they then deposit on the ground.